Bipana sharma was only eleven years old when she inspired to create a child friendly society in Nepal. By the time she was sixteen, she was doing these extraordinary things that was not just benefiting the society in primary or district level, but was slowly creating a cornucopia of empowerment and motivation in national level. However, very few were actually familiar with Bipana Sharma. It was necessary to bring her into “the spotlight”, provide her right exposure, and ultimately create ripple effect. It was necessary to give voice to youths like her and many others who did not just believed in change, but inspired change. Glocal Teen Hero is a platform based on one such idea. I remember being a teenager myself. Conflicting between what I was supposed to do, to what I really wanted to do. It was expected of me to study and ace my examination; however, that barely motivated me, leave alone inspire me to go beyond my reach. Our collaboration of Glocal Teen Hero encourage teenagers to build a different history. We look forward to address their initiation and give them an opportunity to deliver what they are best at. Moreover, to apply for Glocal Teen Hero and get right exposure, you must primarily be a teenager (13-19). You must be a Nepali Citizen. You could have accomplished outstanding award or initiated in any field (music, arts, dance, martial arts, photography, leadership, volunteering, entrepreneurship, science and technology,etc) .OR, Initiated or innovated your own ideas into action. You could also be someone who has achieved, initiated, contributed in any field outside of school/college curriculum or has made difference in the community locally, nationally or internationally. Secondly, you can also nominate eligible candidate by providing us name, phone number and email address of the respective person. Furthermore, the application for Glocal Teen hero is already out, the application process ends on 30 June 2016 midnight. 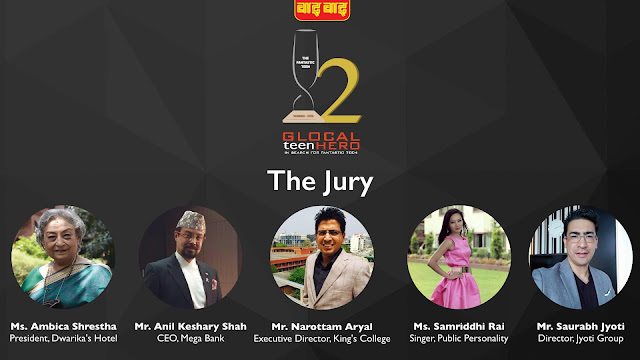 You can apply and nominate from link provided (http://teenhero.glocalkhabar.com/apply/).